Bodh Gaya or Bodhgaya is the place of Buddha’s attainment of Enlightenment. The complex, located about 96 kilometers from Patna (situated at latitude 24° 41′ 45″ N, longitude 85° 2′ 2″ E) in the state of Bihar in India, contains the Mahabodhi Temple with the diamond throne (called the Vajrasana) and the holy Bodhi tree and was built over 2500 years ago. This tree is a sapling of the Sri Maha Bodhi tree in Sri Lanka, itself a sapling of the original Bodhi tree. 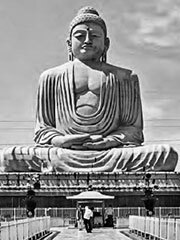 For Buddhists, Bodh Gaya is the most important of the four pilgrimage sites related to the life of Gautama Buddha, the other three being Kushinagar, Lumbini, and Sarnath. As of 2002, Mahabodhi Temple located in Bodh Gaya, is a UNESCO World Heritage Site specifically nominated for the international World heritage program. According to Buddhist traditions, circa 500 BC Prince Gautama Siddhartha, wandering as a monk, reached the sylvan banks of Falgu River, near the city of Gaya. There he sat in meditation under a peepal tree (Ficus religiosa). After three days and three nights of meditation, Siddharta attained enlightenment and insight, and the answers that he had sought. Enlightened by the new thought, he spent seven weeks at seven different spots in the vicinity meditating and considering his experience. After seven weeks, he travelled to Sarnath, where he began teaching Buddhism. It is believed that 250 years after the Enlightenment of the Buddha, Emperor Ashoka visited Bodh Gaya. He is considered to be the original founder of the Mahabodhi temple. It consisted of an elongated spire crowned by a miniature stupa and a chhatravali on a platform. A double flight of steps led up to the platform and the upper sanctum. The mouldings on the spire contained Buddha images in niches. Some historians believe that the temple was constructed or renovated in the 1st century during the Kushan period. With the decline of Buddhism in India, the temple was abandoned and forgotten, buried under deep layers of soil and sand. The temple was later restored by Sir Alexander Cunningham as part of his work for the British Archaeological Society in the late 19th century. In 1883, Sir Cunningham along with J. D. Beglar and Dr. Rajendralal Miitra painstakingly excavated the site. Extensive renovation work was carried out restoring Bodh Gaya to its former glory. Presently, several Buddhist temples and monasteries built and maintained by the people of Bhutan, China, Japan, Myanmar, Nepal, Sikkim, Sri Lanka, Thailand, Tibet and Vietnam dot the landscape around the temple. These buildings reflect the architectural style, exterior and interior decoration, and idols of their respective countries. The idol of Buddha in the Chinese Temple is 200 years old and was brought from China. Japan’s Nippon Temple is shaped like a pagoda. The Myanmar (Burmese) Temple is also pagoda shaped and is reminiscent of Pagan. The Thai Temple has a typical sloping, curved roof covered with golden tiles. Inside, the temple holds a massive and spectacular bronze idol of Buddha. Next to the Thai temple there is a 25 meter statue of Buddha located within a garden rhat has excised there for over 100 years.